Below is the 2018 season recap for the Tennessee Titans. 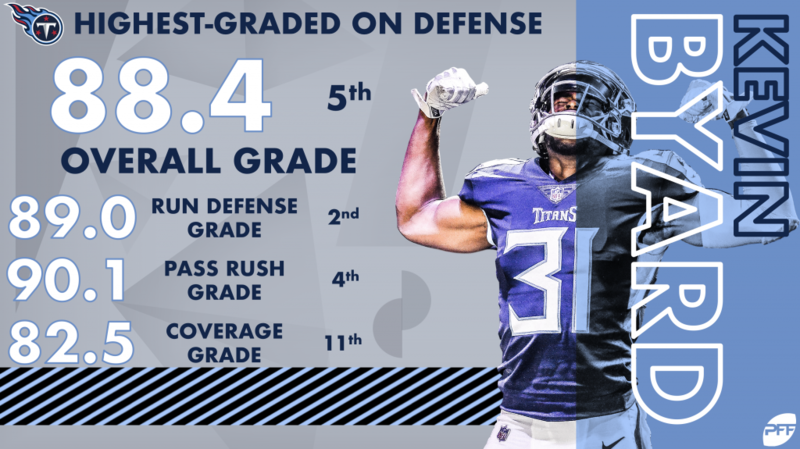 Despite their 9-7 record in 2018, the Tennessee Titans did little offensively as they were carried by their top-10 defense, while former No. 2 overall pick Marcus Mariota struggled at times. 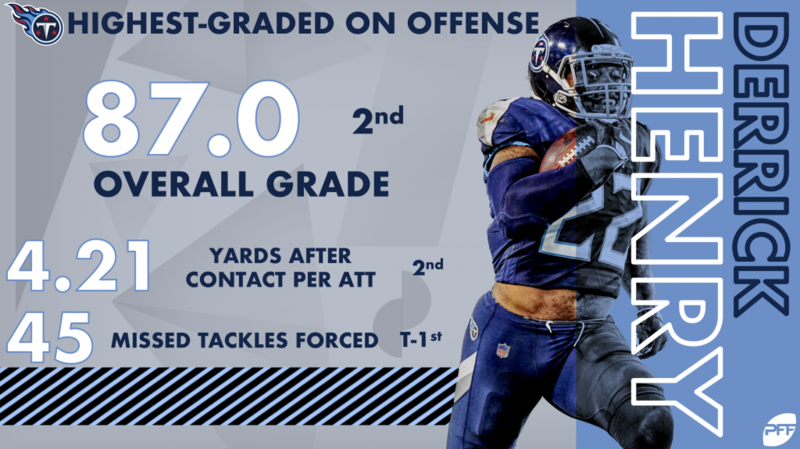 Derrick Henry was a revelation, finishing as the second-highest-graded running back in the NFL, ranking second in yards after contact and tying Adrian Peterson for most missed tackles forced. 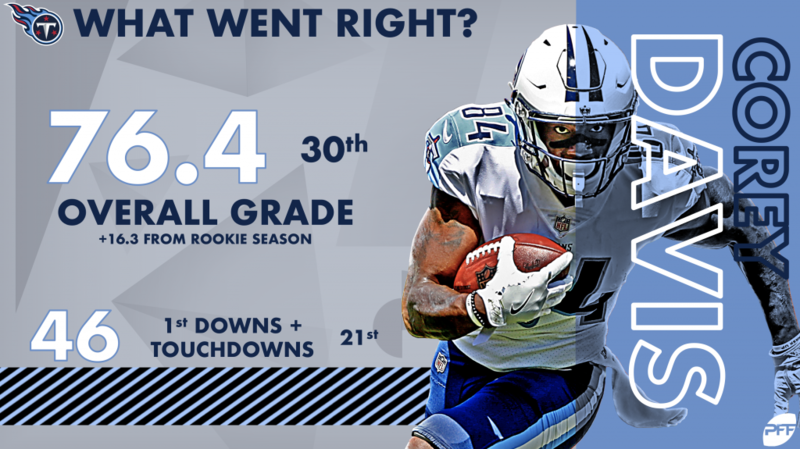 Wide receiver Corey Davis improved upon a dismal rookie year to rank 30th overall at the position, scoring four touchdowns and racking up an additional 42 first-down receptions. Jurrell Casey was once again a strong pass-rushing force from the middle of the defensive line, racking up 44 pressures. He now has accumulated a total of 339 QB pressures since 2011. Safety Kevin Byard was up to his usual bag of tricks, limiting receivers in his primary coverage while also sticking his nose in run defense and as a blitzer. 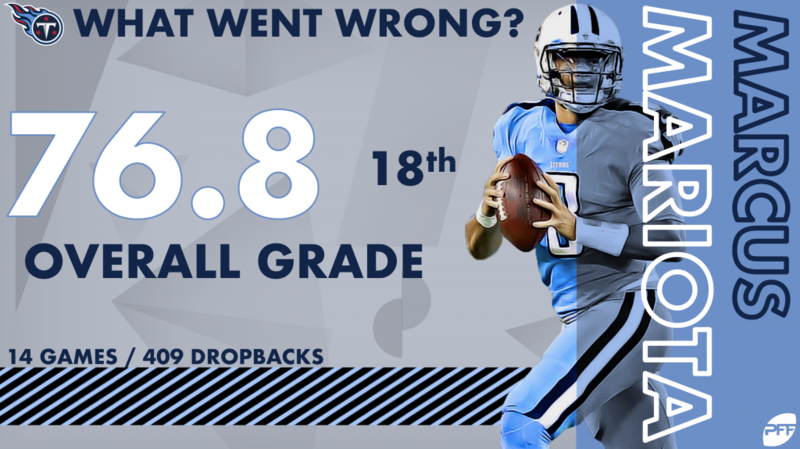 Mariota was limited to 14 games and put forth just the 18th-highest-graded season among quarterbacks. However, it actually got worse when he was out, as Blaine Gabbert’s 33.6 overall grade ranked dead last in the NFL among quarterbacks with at least 100 dropbacks. Guard Josh Kline allowed 38 pressures on the season, finishing the year as just the 53rd highest-graded guard in the league. 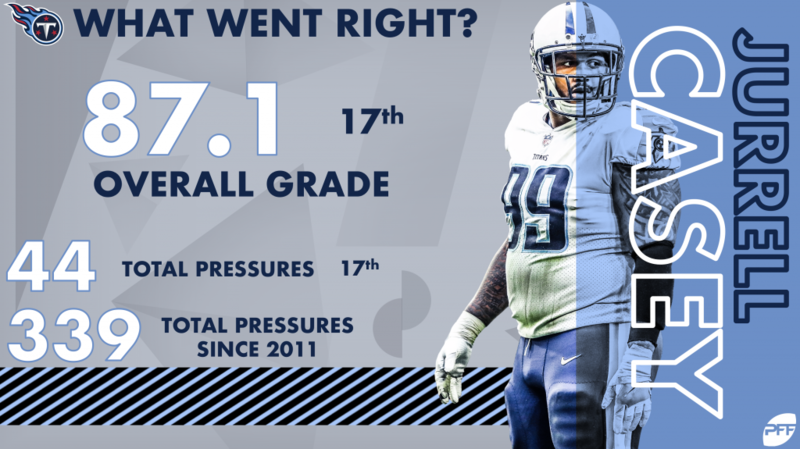 Outside of Jurrell Casey, no Titans defensive lineman ranked inside the top 40 in terms of QB pressures on the season, and only rookie Harold Landry cracked the top 50. Derrick Henry lit up the field with his tackle-breaking prowess and made one of 2018’s most memorable plays when he scampered up the left sidelines for a 99-yard touchdown run against Jacksonville in Week 14. 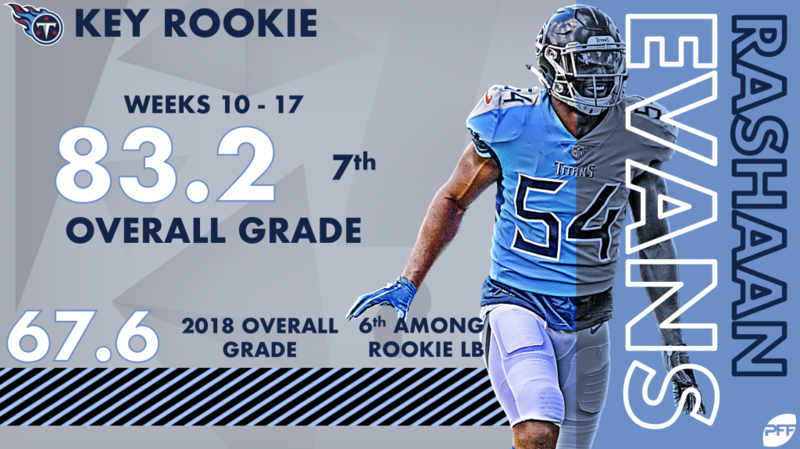 Kevin Byard finished the season as the Titans’ highest-graded player on defense, as he grabbed four interceptions and didn’t allow a reception longer than 17 yards on 30 targets as the primary coverage defender. 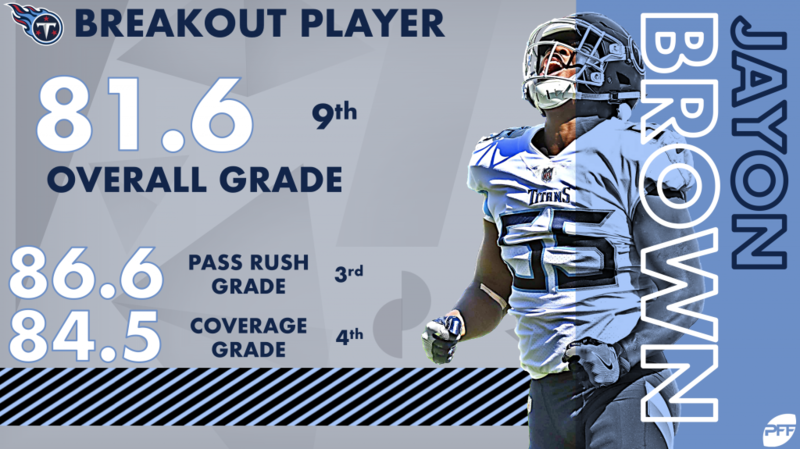 Linebacker Jayon Brown broke out for the Titans, impressing as a pass rusher and in coverage. Linebacker Rashaan Evans flashed his big-time potential in stretches, including three consecutive game grades of 83.4 or higher from Weeks 13-15. He finished the year as the sixth-highest-graded rookie linebacker. Tennessee had their moments last year but will have to tighten up their protection and hope for more from a middling offense that ranked just 27th in points scored 2018.